We reported back in April that company founder Steve Saleen won the legal rights to use his own name and after a lengthy hiatus, Steve and the company that bears his name have introduced their first “customized” Ford Mustang at the Los Angeles Auto Show with the debut of the new 700 horsepower Saleen 351 Mustang. "Since regaining the Saleen brand, I really want to bring it all together with the heritage that Saleen is known for", said Steve Saleen. 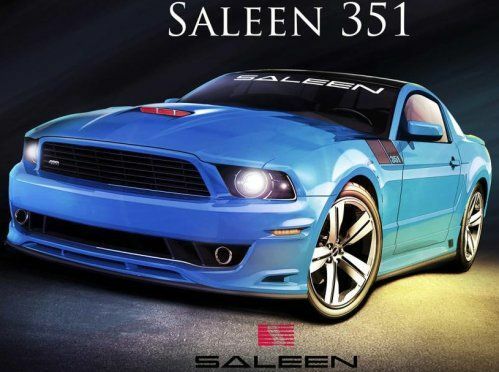 "With the current Saleen  Mustang model it provides all the right features to bring back and update the S351 model." The Saleen 351 Mustang is built around a unique 351 cubic inch V8 engine topped by the Saleen 296 supercharger system that churns out a stunning 700 horsepower and 655lb-ft of torque. All of this power is channeled to the rear wheels via a 6-speed manual transmission fitted with a heavy duty Saleen clutch package while 3.73 rear end gears help to offer great acceleration (and probably an incredible top speed). "Everything about this project has been mindful of the goal to create the most potent Mustang on the market", said Al Wagner, V.P. of Engineering. "I think we have certainly pushed the bar in the production Mustang segment with our 351 offering. Once the project came together I couldn't help but thinking; if the 302 mustang is using a coyote engine, the 351 is definitely the gray wolf of the class." Once the Saleen engineers had beefed up the drivetrain to offer the proper level of performance, the team turned their attention to the braking system to ensure that the new Saleen 351 Mustang can slow down when those 700 ponies are working hard. A Saleen braking package featuring monstrous 15 inch front brake rotors and multi-piston calipers fitted with high performance brake pads help to get this high powered Mustang get stopped in a hurry. Helping to allow the Saleen 351 Mustang handle the corners is a Saleen S4 suspension system coupled with unique 20 inch wheels (9 inches wide up front, 10 inches wide out back) with a 5-spoke design wrapped in high performance rubber – also helping the Saleen 351 to make the use of the 700 horsepower with the best traction possible. The Saleen 351 nomenclature first appeared in 1994 with the introduction of the legendary Saleen S351 with 371 horsepower followed by the S351 Speedster in 1995. The last 351 cubic inch powered Saleen Mustang came in 1999, with that supercharged V8 packing 495 horsepower and 490lb-ft of torque. Long carbon fiber side sills, a new carbon fiber rear diffuser with an “F-1 style tail lamp” and a low profile rear spoiler. There is also an array of Saleen-specific badging including the 302 stripes that start on the fenders and extend up onto the hood along with unique badging on the grille and on the back end. The bad news is that no information has been offered on the pricing or availability of the new Saleen 351 Mustang. Also, since Saleen debuted the car at LA only in the picture shown above (they did not bring the car to the LA Auto Show), the only image that we have is the one shown here. This means that we do not know what the back end of the new Saleen 351 Mustang looks like but we expect that it will not be long before the Steve Saleen and the brand that is rightfully his issues a full spread of images of their new super-Stang.